There are certain events in history that imprint themselves into the psyche in such a way that, so they say, you can remember where you were when something happened, or you heard of its happening. The death of John Lennon, and of Diana, and 9/11 are such events for me - they will always be associated with certain places in my mind. What can one say about this album? 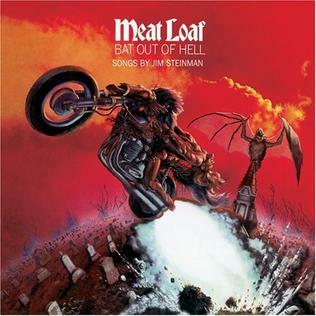 Firstly, the album cover is stunning and iconic: Richard Corben's biker emerging from the grave, the lush red of the sky, and the enormous bat standing atop the mausoleum, is rightly judged to be one of the best album covers of all time. The music is principally the work of Jim Steinman, acknowledged on the cover after some contentious wrangling with the label, and owes much to Todd Rundgren's production for finding the sound. In fact, the combination of Steinman's writing, Rundgren's production and Meat Loaf's vocals seem to have found the perfect fit here. For a teenager in the 1970s, this album brought a wonderful amalgam of motorcycles, excitement and the fumblings of pubescent sexual encounters. The album begins with a road accident in which the unnamed 'hero' of the songs is dying, and the rest of the album sees him reliving some of the formative scenes of his young life. These are played out in a heat of heavy guitars and emotive string arrangements, both of which add depth to Meat Loaf's expressive vocals. This is a heady mix of good old-fashioned rock 'n' roll (Paradise by the Dashboard Light, and the last part of All Revved Up...), ballad (Heaven Can Wait, Two Out Of Three... and For Crying Out Loud), and even some very progressive elements in the title track.